One of the great things about Jamaican mento music – the local, popular music of Jamaica which first began appearing on record in the 1950s – is that, besides being a joy to listen to, it is extremely well documented. Not only are there a number of excellent CD reissues featuring many of the best mento performers that ever cut a record, but Michael Garnice’s Mento Music website is one of the most informative and complete resources on the subject. One can scarcely attempt to understand mento without digging into his site, and I gleaned most of this post directly from information therein. As Garnice points out on his website, mento was a diverse music, and characteristics of it eventually led to ska and reggae. In essence, however, much of mento had a rural sound to it, with banjo, bamboo saxophones and clarinets, and a particular style of vocal delivery that was direct, even harsh at times. It often gets lumped in with calypso music from Trinidad. 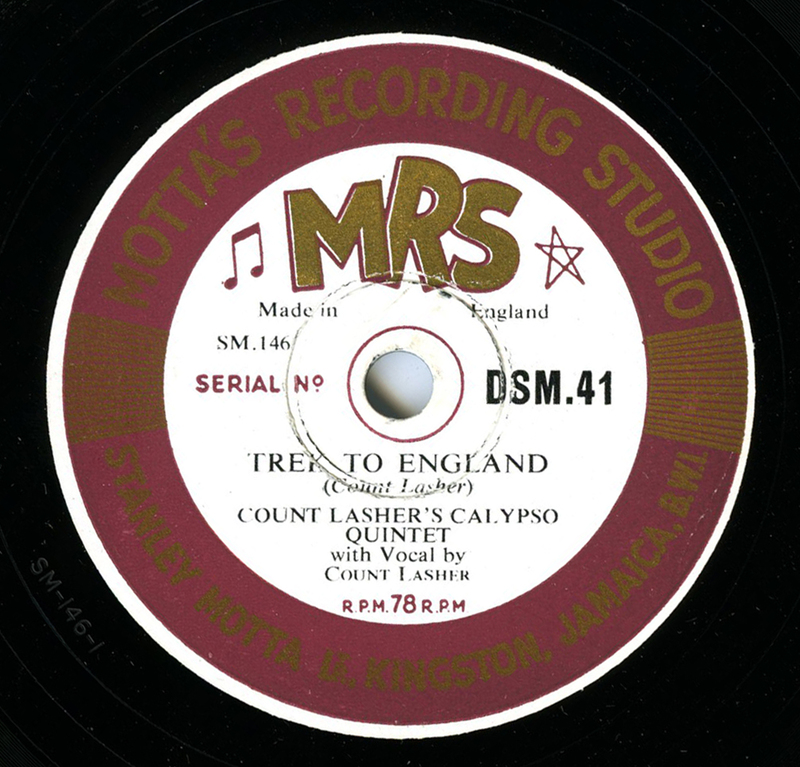 Record labels would bill mento bands as calypso bands on their records, and several mento artists had names that sounded like popular calypso artists, such as Lord Power, Lord Composer, and today’s featured artist, Count Lasher. The music, however, was decidedly different than most calypso. Perhaps the most obvious connection was mento’s lyrical content, which was often funny, at times bawdy, and often addressed topical issues of Jamaica that were important during what Garnice calls the “Golden Age” of mento, the 1950s. Another interesting fact is the majority of early mento records were issued by local Jamaican labels, and were pressed in England (where there also was a Jamaican record-buying public). Kalypso, Chin’s, and Caribou were three popular independent labels, now quite difficult to find. There was also Calypsodisc, Hi-Lite, Times Record, Maracas, and Crystal, among others. The first and arguably the most important Jamaican label was MRS – Motta’s Recording Studio – which, although they issued only about fifty 78s, proved to be popular and influential. “Motta” was Stanley Beresford Brandon Motta, a businessman and shop owner from a family of Sephardic Jews in Kingston. He set up his studio in a woodworking factory in 1951 and began recording and issuing discs, which were pressed by Decca in London. The MRS label was discontinued around 1957, when mento’s popularity was waning. Terence Parkins aka Count Lasher was a talented and significant mento star, though little biographical information on him has surfaced. He recorded at least 7 discs for MRS, and numerous others for Chin’s and Caribou (sometimes under the name “Count Lasha” or, occasionally, totally uncredited). He continued recording into the 70s and even issued reggae singles before passing away in 1977. This track features some terrific clarinet and guitar, as well as some nice banjo plunking. The lyrics address the issue of immigration by Jamaicans to England. Also important – it has never been reissued. Very nice. Lasher was one of the best. You’re right about the Jamaican record buyers in the UK in the 50s, but either they didn’t buy many records, or they played them to destruction, because mento 78s are very hard to find (or maybe they preferred to listen to Calypso records, which are much more common). Fortunately, some great mento was also released on 45s, and those tend to be easier, especially on Kalypso. I agree – the bestsellers can be found, but beyond that, mento 78s can be few and far between, and often appearing very “well-loved”! Great track, can I ask what the flip side is, is it an unreleased cut also? A few years back I was lucky to score a dozen mento 78s in the suburbs outside Philadelphia, on Trojan, kalypso, chins and maracas, you never know where the good stuff will turn up.